I hope you have been enjoying Season Four of Finding Your Roots with Henry Louis Gates, Jr. The next episode airing on Tuesday, November 21st will feature actress Tea Leoni's mother's adoption story. Due to the adoption taking place in Texas, which is a closed adoption record state, we were unable to learn any information regarding her biological family through the records, so DNA was the only answer. Fortunately, I was able to identify both of Tea's biological maternal grandparents through DNA research. I will briefly appear on the show to discuss my work with Dr. Gates. I hope you will watch! From what it appears, most markets will air reruns of Finding Your Roots from Season 3 for the following two weeks. Based on the schedules I found online, it seems that the two episodes on which I appeared last season will re-air on Dec 5th. So if you missed LL Cool J's mother's adoption story and DNA success and Jimmy Kimmel's touching episode last season, please tune in for those as well! The new season will then restart with the last two episodes on December 12th and 19th. For my genetic genealogy friends, Charlayne Hunter-Gault also had some very interesting DNA research. It can't all be included in the episode due to it being so extensive, but some of it will appear. Following is the schedule to my knowledge. Please check your local listings. If you haven't yet signed up for our I4GG Conference on Dec. 9th and 10th in San Diego, Tuesday November 21st is the last day for early registration. It will be two entire days of exclusively genetic genealogy instruction! 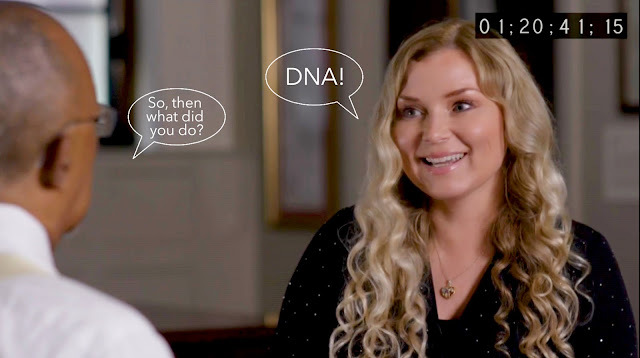 We have many wonderful speakers from among the leading researchers in our field as well as representatives from all five of the major DNA testing companies that offer genealogy features. The schedule can be found here. We are getting very close to filling up and registration may close at any time, so please don't delay if you plan to attend. Stay tuned for the upcoming Black Friday DNA kit sales later this week. I will publish them here as soon as they started coming in. In the meantime, 23andMe's great Thanksgiving deal is coming to an end this Thursday. Single Ancestry-only kits (no health results included but can be upgraded later) are only $69 and if you buy two or more, then are only $49 each, which is an amazing deal. The offer runs through Thursday. Order here. This was a fascinating episode- Tea Leoni and Gaby Hoffman were great guests. I'm glad Cece made an appearance with the wonderful Dr. Gates, and helped find the answers for Ms. Leoni. Thank you, Leigh Anne! So glad you enjoyed it.